Josh Duhamel with Marine Sergeant Ben Tomlinson. © General Motors. DETROIT – In honor of Military Appreciation Month, and as part of the ongoing relationship between GMC and veteran support program Building for America’s Bravest, the brand is calling on its staff, fans and fellow Americans to support the foundation’s work to build life-changing smart homes for severely injured service members. GMC has committed to contribute up to $2 million by the end of 2016 and is asking people across the country to “enlist to unlist” the more than 200 severely injured service men and women currently waiting for smart homes. 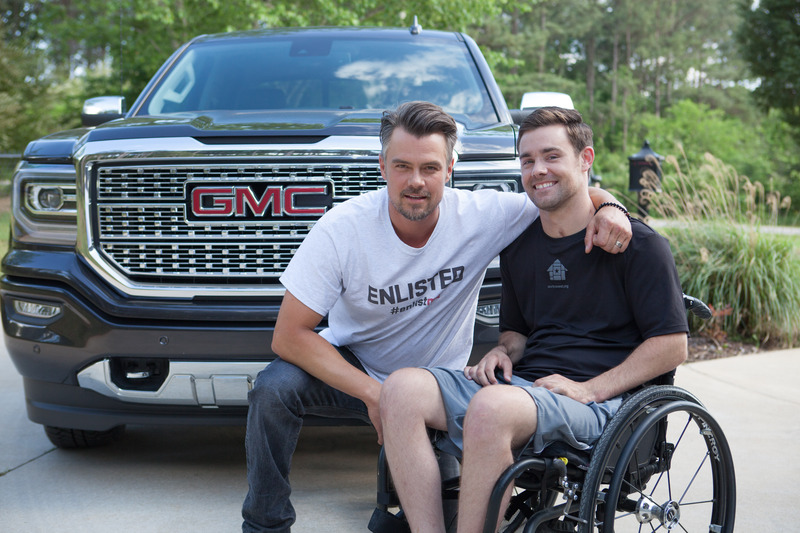 As part of the campaign, a continuation of the #enlistme activity started in 2015, GMC has enlisted the support of actor Josh Duhamel as campaign ambassador, in an effort to increase awareness and raise funds to make significant differences in the lives of these courageous service members. GMC and its parent company have supported the U.S. military for more than 100 years, working with the mantra of “Helping, Hiring & Driving,” through a mixture of employment programs, veteran support programs and offering the best possible automotive military discount during Military Appreciation Month, which is offered to all 21 million veterans and their families through May 31, 2016. Read the entire article at GMC.com!